Most theatregoers will have only learned about Carl Peter Værnet from watching Claudio Macor‘s new play Savage, now running upstairs at the Arts Theatre. But the Nazi doctor from Denmark has played a large role in the life of LGBTI activist Peter Tatchell for decades. It was in the late 1980s that Tatchell first learned of Værnet, and the devastating “cure” he practised on homosexual prisoners at Buchenwald concentration camp. In the years since, Tatchell has waged a long campaign to raise awareness of Værnet’s war crimes and to extract an apology from the Danish and British governments for aiding and abetting the doctor’s post-war escape to Argentina, where he lived openly with his family, free from prosecution, until his death in 1965. What are the big battlegrounds for gay rights today? Can ground already gained still be lost? It was an article that Tatchell wrote about Værnet last May, on the 70th anniversary of Denmark’s liberation from the Nazis, that inspired Macor to write Savage. The play details Værnet’s story alongside a fictional story of a young gay couple affected by his treatment. 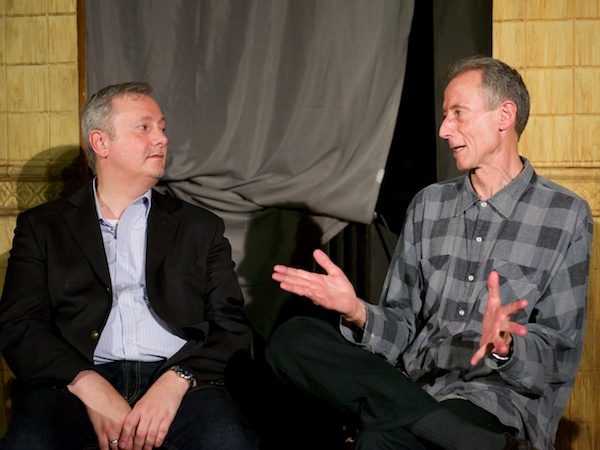 After last night’s performance of Savage, I chaired a Q&A with Peter Tatchell, Claudio Macor and the show’s producer Andrea Leoncini, with some very lively interjections from the eight-strong cast and the evening’s sell-out audience. Why were no Nazis pursued for war crimes against homosexuals? Why have the British and Danish governments kept information classified? What other “cures” are still being pursued and where, including some state-funded programmes? What are the big battlegrounds for gay rights today? Can ground already gained still be lost? How worried should the gay community be about the rise in hate crime post-EU referendum? Have a listen to the full, unedited podcast for answers, and many more questions, and scroll through the live-tweets care of @SavagePlayUK (and Alistair Frederick). Photos from last night’s event are care of Peter Jones, production photography is by Roy Tan. Savage continues Above the Arts Theatre in the West End until 23 July 2016.